WASHINGTON, DC--(Marketwired - May 28, 2013) - There is perhaps no better family vacation destination than DC. From museums and monuments to festivals and great food, the city offers something for every family. To ensure visitors have everything they need to experience the best of the city, Washington Marriott Wardman Park is offering a Family Fun at the Park package, filled with perks to help create the perfect summer. With the Family Fun at the Park package, guests will receive a treat-filled Welcome to the Park bag, one full-day Metro pass, one in-room movie, complimentary Internet access and 1,500 Marriott Rewards® bonus points. Rates start as low as $149 a night, and for just $30 more, guests can upgrade to a suite. Located less than a block from the Metro, this hotel makes it easy to visit the area's top attractions. Guests can walk to the nearby National Zoo or Rock Creek Park, where they can hike trails, horseback ride, canoe and kayak; play tennis; catch live music and performances or take part in educational programs. A quick hop on the Metro will take visitors to DC's top tourist attractions including the Smithsonian Museums, Spy Museum and government monuments and buildings. A stay at this family-friendly Washington, DC hotel not only gives guests access to the city's top attractions, but has plenty to offer onsite, too. Spend a sunny afternoon in the outdoor pool, satisfy a sweet tooth with a fresh pastry from Illy's, or retire to a guest room where a plush bed is the perfect place to watch shows and movies on the 32-inch flat-screen TV. To book The Family Fun at the Park package, visit at https://www.marriott.com/specials/mesOffer.mi?marrOfferId=815433&displayLink=true or call 888-486-5994 in the US; be sure to enter/ask for promotional code MRP. Washington Wardman Park Marriott is no stranger to treating guests like VIPs -- its past visitors include U.S. presidents and dignitaries -- and every guest, no matter what they're credentials, receives the same attentive service. Blending modern amenities and historic charm in a landmark setting, this NW Washington, DC hotel is situated on 16 beautiful acres and just across from the National Zoo. 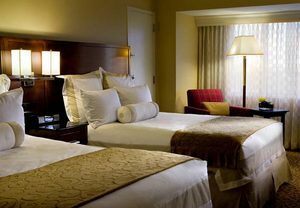 With 1,314 guest rooms including 125 VIP suites, Washington Wardman Park Marriott can accommodate every type of traveler, from the family on summer vacation to the business woman in town for a conference. Each of the modern guest rooms features a spacious work area, high-speed Internet access, plush bedding, 32-inch flat-screen cable TV, coffee/tea service and in-room dining. Working late doesn't have to mean missing out on a workout; the fitness center is open 24 hours, and the sauna and heated outdoor pool are great ways to relax after a long day. Gather friends or family for a meal at the hotel's Cleveland Park restaurants, featuring fine steaks at Stone's Throw Restaurant and Bar, gourmet coffee and fresh-baked treats at Illy's, Old English fare with an American twist at Harry's Pub, and tasty to-go items at Woodley Market. Nearby get in touch with nature at Rock Creek Park, discover new designers at Adams Morgan's funky boutiques or travel the world on Embassy Row. Catering to government agencies, major corporations and families with something to celebrate, the hotel's 195,000 square feet of event space comes with the expert planning skills of a professional team. Marriott Hotels & Resorts is Marriott International's signature and most widely distributed brand. Marriott continues to inspire performance and a balanced life on the road for discerning and high-achieving business and leisure travelers, offering warm, professional service; sophisticated yet functional guest room design; lobby spaces that facilitate working, dining and socializing; restaurants and bars serving international cuisine prepared simply and from the freshest ingredients; meeting and event spaces and services that are gold standard; and expansive, 24-hour fitness facilities. All Marriott hotels participate in the award winning Marriott Rewards frequent travel program that allows members to earn hotel points or airline miles for every dollar spent during each stay. For more information, visit www.MarriottHotels.com. Follow Marriott Hotels & Resorts on Twitter at www.twitter.com/Marriott. To ensure visitors have everything they need to experience the best of Washington, DC, Washington Marriott Wardman Park is offering a Family Fun at the Park package, filled with perks to help create the perfect summer.